A Cowboy Stunt Double Who Made The Stars Look Good For decades, Dean Smith doubled for Gene Autry, John Wayne and other Hollywood stars in some of America's most iconic Westerns. Those days are behind him, but Smith is still a cowboy at heart. 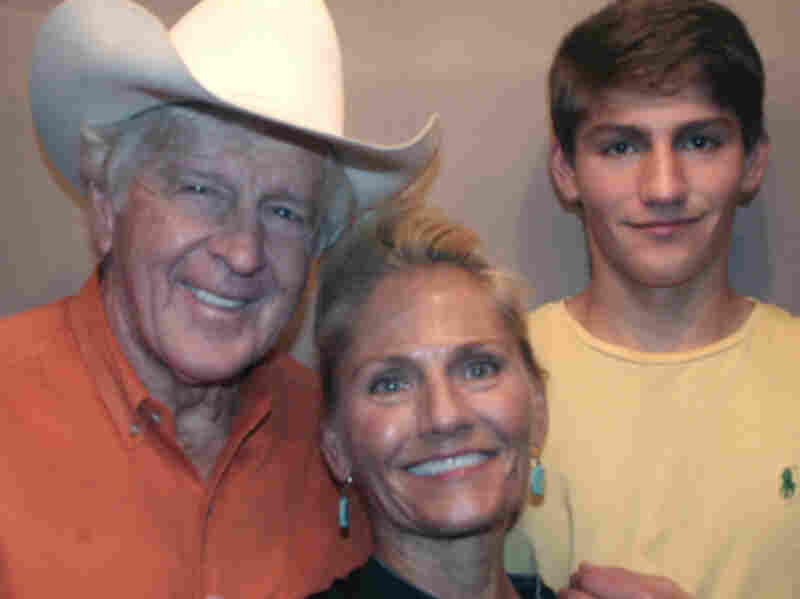 Dean Smith with wife Debby and son Finis at an interview with StoryCorps. For 40 years, Dean Smith made his living as a stunt double in Hollywood Westerns — including eight Oscar winners and nominees — like True Grit, The Alamo and How The West Was Won. "I was able to make all the leading men look good," Dean tells his wife Debby in an interview with StoryCorps. And not just men, he adds. "One time, I doubled [as] Maureen O'Hara. I got the clothes and I got this big red wig. When I got back on the set, they laughed at me and they said my legs didn't look too much like Maureen's," he laughs. "Now, everything can't be all autographs and sunglasses," Dean says. "There's a lot of people that helped me. Guys like Roy Rogers and Gene Autry and John Wayne, all these guys, well, they were like my relatives. And then I woke up one morning and they had all gone." Now, the Smiths live on the farm where Dean was raised in Breckenridge, Texas. "It's not the biggest ranch in Texas, but it's a piece of dirt that I'm sure proud of. And when I die I'll never be able to get all this dirt in that casket with me," he says. "How would you like to be remembered?" Debby asks. "As the cowboy that could ride, run and jump with anybody in the world," he says. "I'd like to do it again! Now that's what I'd like." Audio produced for Morning Edition by Jasmyn Belcher.